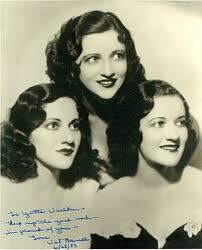 THE BOSWELL SISTERS. This book is going to be more than a family memoir, more than an adoring fan’s tribute . . . it places the Sisters in their proper historical context — alongside Bing, Louis, and FDR, lighting the way. And — if that’s not enough for the objects of our affection — there’s also a Bozzies website full of music and history and more: BOZZIES. The Sisters are irreplaceable but also the best tonic and panacea I know . . .
Posted in "Thanks A Million", Bliss!, Hotter Than That, Irreplaceable, Jazz Titans, Pay Attention!, Swing You Cats!, The Heroes Among Us, The Real Thing, The Things We Love, Wow! I looked forward to inspiring music last Sunday night — Sunday night sessions at The Ear Inn (326 Spring Street, Soho, New York City) are always emotionally rich and enlightening. I could trust the four swing masters a few feet away from my perch at the bar: Jon-Erik Kellso, trumpet; Dan Block (clarinet / tenor); Chris Flory (guitar); Jon Burr (string bass). After the first number had ended, Jon-Erik told us that the EarRegulars would be celebrating Presidents’ Day by honoring Lester Young — the man Billie Holiday called “the President,” after Franklin Delano Roosevelt. Much of the music made last night had direct references to Lester, and these two performances were standouts. TOPSY was a Basie classic in the great early period of that band; WAY DOWN YONDER IN NEW ORLEANS was not only a foreshadowing of Fat Tuesday 2012, but a reminder of Lester’s happy childhood in that city, and an evocation of the Kansas City Six. The EarRegulars don’t need to make a special point of honoring Lester Young: their floating solos, resonant sounds, their awareness that space is just as essential as the notes, their twining counterpoint, and fluid swing are homages to the Master, no matter what they play.